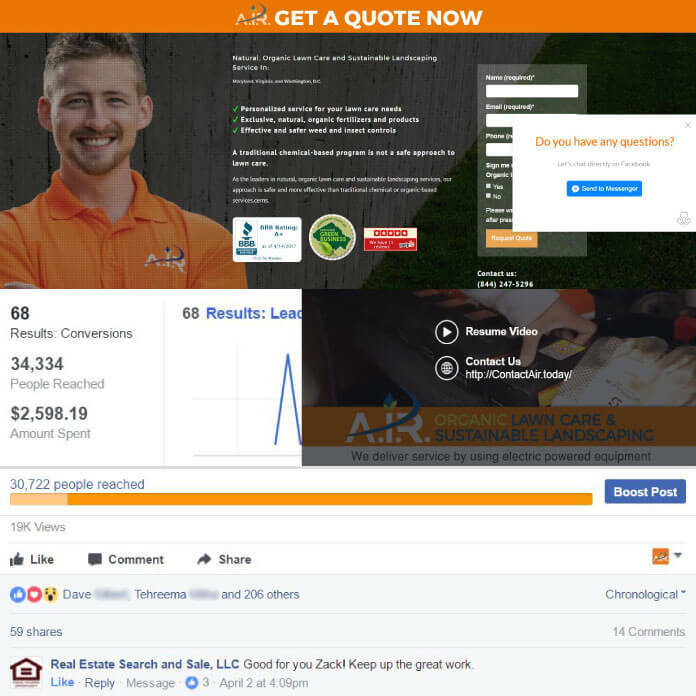 Zack Kline, the founder of A.I.R., has been in business since being awarded a check for $5,000 in the Bernstein Business Entrepreneurship Competition. He has been hustling and grinding for the past 5 years, recently hitting the 6-figure mark, now employing a full ground operation. 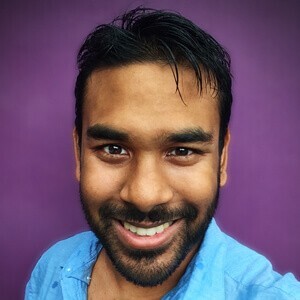 He figured out how to get a WordPress site up, knew the importance of social proof, leveraging Yelp, and even managed to get a steady stream of leads through basic on-page SEO. Like many solopreneurs, he has been too busy running his business rather than focusing on Digital Marketing—something that he knew he should be doing but never prioritized it—sound familiar? He would spend his time with traditional marketing methods; going to trade shows, connecting with powerful industry influencers, and networking. I leveraged a combination of the power of Facebook’s targeting capabilities with repurposed video content (see an elaboration of the strategy below). Within the first week and a skeptical $200 in adspend, Zack’s phone pinged with lead notifications every day. "We started with about $200 a week in adspend and the results were amazing. 61 new leads over the course of 3 weeks! The average cost per lead was $30 per lead and the average contract value I was selling was $3-5000." This is not a step-by-step guide but I will tell you exactly how I came about the resources I used and how you can do it for yourself if you wanted to replicate my success. Facebook optimizes for video: Newsfeed videos are played automatically—this also means there is a higher barrier to entry when investing initially in the content. Luckily my client had high-production quality video that I was able to repurpose. *note: depending on your audience, a low quality, dimly-lit video shot from your smartphone may work just as well. Lowers overall costs: The sheer amount of seconds your brand gets in front of a person’s eyeballs are pennies; it’s an order of magnitude lower than the costs of, say billboards or commercials, but even also a standard image ad. 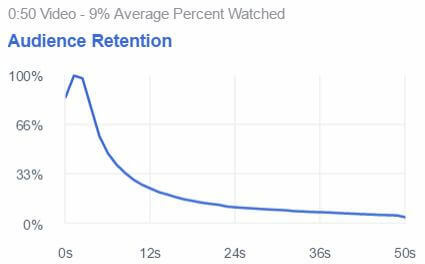 Targeting based on the % of video watched: Most people will stop watching after the first 3 to 10-seconds, that’s a given. But 5-10% will watch more than half the video and Facebook will let you retarget those people. The cost for these people to convert are that much lower since they’ve had another touch point to get to know your brand. I mentioned I repurposed old video content. You can, too. There are services out there as well. Since I have film and animation experience, I instructed an editor to throw in a text overlay and embed the captions directly in the video. Remember, the first 3-seconds are important to engage your audience. This part is dependent heavily on how well you know the audience. Creating avatars are crucial, and crafting a respective message to each avatar. Start broad and analyze your data to segment age, gender, location, etc later. Since he’s only based in 1 city, it’s straightforward to target within a certain radius. Facebook takes the warm data you give it and then extrapolates a cold audience that is most similar to your ideal audience. You can make a lookalike from almost any warm traffic: an email list, people who like your page, visit your website or watched your videos. If I have the traffic, I start with targeting a lookalike audience from the beginning. It’s the intersection of big groups that we’re most interested in. I wasn’t making up the number that 5-10% watch more than 50% of the video. My numbers tell me this! It’s the people who watched more than 50% I really care about. There are a number of elements that factor into how you should design the landing page after someone clicks the ad. Ad congruency is high up there, which means the page should match your offer. It needs to be similar in style, text, and expectation. One main call-to-action – your page should have ONE goal. They either leave or do what you want them to do. 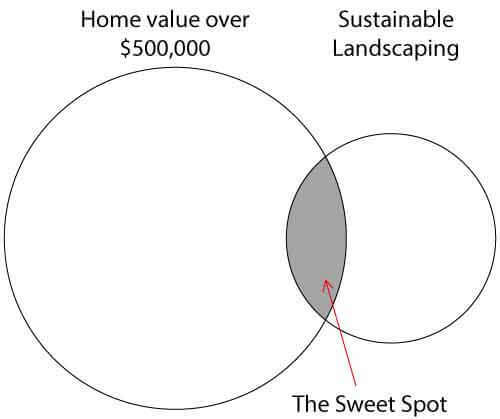 Benefit driven copy – focus more on the benefits rather than features. Trust logos and social proof – Money back guarantees and testimonials are staples here. You can use a plugin like Optin Monster to present people with a special, promo, or question to get them to give you feedback. I levered ManyChat’s* feature to open Facebook Messenger. This display pops out when a user is about to leave the page. 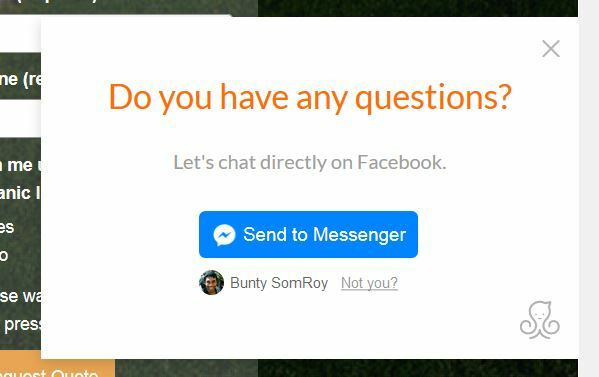 *ManyChat is a messenger bot that I used to automate responses both from a Facebook Messenger Ad AND capture questions. ActiveCampaign is a powerful service that handles everything from capturing form data to a follow-up email sequence. Behavior-based automation is what’s key. 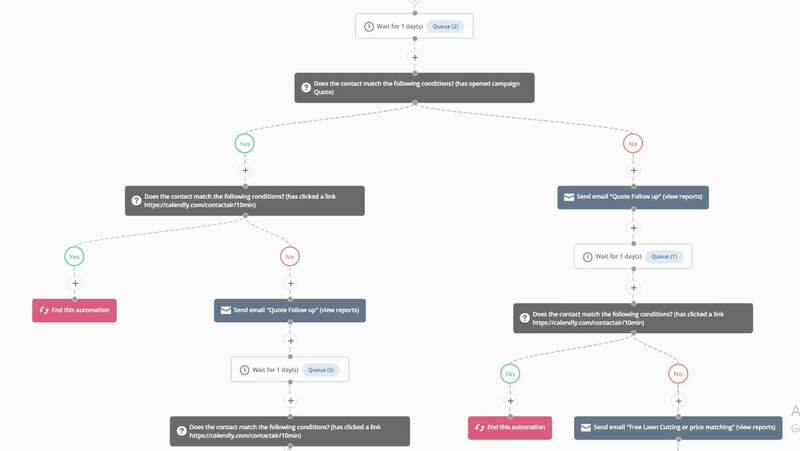 The flow chart executes an action defined by a set of conditions: opened an e-mail, clicked a link, responded, etc. The last bit in the tech stack is Calendly, a scheduling service. It saves the back-n-forth of scheduling a call. 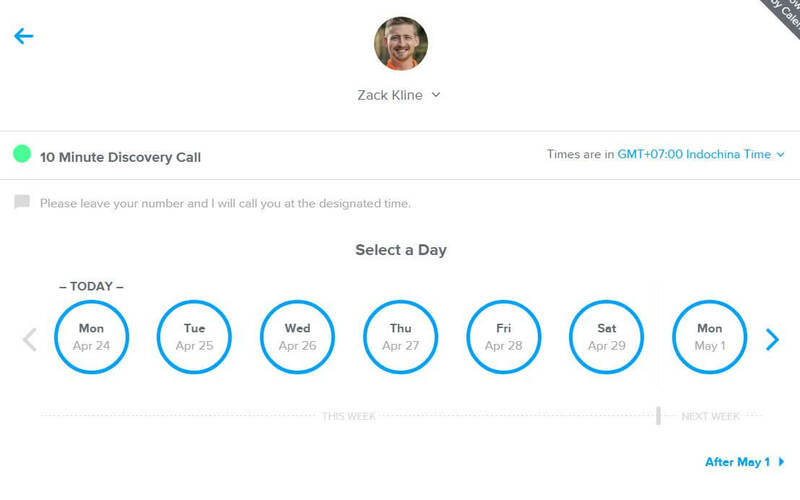 A link is embedded in the e-mail that the person receives to schedule a call. A notification appears on my client’s phone with the phone number and time to call. Fun fact: Calendly coordinates between time zones for those of us talking to people across the country/world.